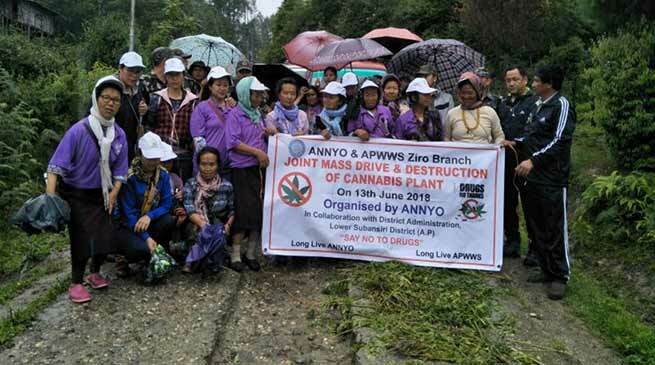 All Niichi Niitii Youth Organisation (ANNYO) and Arunachal Pradesh Women Welfare Society (APWWS), Ziro branch in close coordination with the District Administration and the District Police department conducted second joint mass destruction drive of Cannabis ( bhang ) plants within the periphery of Ziro valley today. The team, in spite of heavy rain, the women members and volunteers successfully carried out destroying huge number of Bhang/Ganja plants in and around Ziro, the release said. Bullo Babu, president, ANNYO appealed to his counterparts and PRI members of Yachuli area to initiate such drives to curtail the drug menace in the district. The joint drive was carried in presences of EAC, Mokar Riba and police personnel’s.